Muslim charity groups posing as "moderates" continue to support terrorist activities, according to a report by the government watchdog Judicial Watch. Bombs killed 30 people in Algeria's capital on Wednesday, attacks claimed by al Qaeda that raised fears the north African oil exporter was slipping back into the intense political violence of the 1990s. Last week, a Russian law banning foreigners from retail stalls and markets, announced by the cabinet last November, finally took effect. While facially neutral, the law essentially targets immigrants from predominantly Muslim countries. One of the subjects of a Dallas police intelligence bulletin, Asma Al-Homsi, says she's known convicted terrorist Wadih el Hage and his wife for more than two decades. On March 31, 2007, Libyan leader Mu'ammar Qaddafi called, in a speech in Niger to Tuareg tribal leaders, for the establishment of a second Shi'ite Fatimid state in North Africa, after the model of the 10th-13th century empire that ruled North Africa, Egypt, and parts of the Fertile Crescent. In his speech, Qaddafi denounced the division of Muslims into Sunni and Shi'ite as a colonialist plot, and rebuked the Arab League members for "hating Iran." 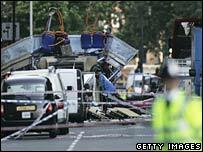 The 7 July bombers attacked a London bus and three Tube trains. Three men have been charged in connection with the 7 July suicide bombings in London. The Supreme State Security Prosecution (SSSP) in Cairo is charging an Egyptian attorney of heading what has become known as the "Egyptian Project" of Al-Qa'ida, the London-based daily A-Sharq Al-Awsat reports. NOVI PAZAR, Serbia - The discovery of a mountain cave packed with plastic explosives, masks and machine guns — and the recent arrests of men devoted to radical Islam — have fueled fears that extremists are trying to carve out a stronghold in this remote corner of Europe. CAIR Seattle Chapter, joins rally denounce to Hamas and Sharia law. On March 31, 2007, concerned citizens across the nation stood in defiance of tyranny, murder, and intimidation. The United American Committee led the second annual Rally Against Islamofascism Day. Supporters rallied to denounce acts of violence and oppression committed by Islamic Jihadis, and rallied against what they believed were dangerous subversive actions of the organization CAIR, the Council on American Islamic Relations. Read more: CAIR Seattle Chapter, joins rally denounce to Hamas and Sharia law. At the fifth conference of the International Al-Quds Institute, held in Algeria, institute head Sheikh Yousef Al-Qaradhawi was asked whether his recent call for "civil jihad" in Palestine would influence people to give up the original jihad. "We were told to fight against Israel, America and non-Muslims," said Muhammed Bakhtiar, 17, explaining why he wanted to become a suicide bomber. "We are so unhappy with our lives here. We have nothing," he said. WASHINGTON, March 26 (UPI) -- Al-Qaida has urged Islamic extremists around the world, especially in the information sphere to aid Islamic militias in Somalia. PARIS, March 26, 2007 (AFP) - Four men of north African origin were arrested Monday in an investigation into a suspected Islamist underground network, police said. MUSLIM pupils at a secondary school in northeastern Nigeria beat a teacher to death today after accusing her of desecrating the Koran. Two Sudanese women have been sentenced to death by stoning for adultery after a trial in which they had no lawyer and which used Arabic, not their first language, the rights group Amnesty International said. 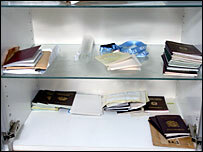 More than 100 officers took part in the raids Fifteen people have been charged following police raids on suspected illegal passport factories.